This November, Langmans Dental Health Centres have been supporting the Oral Health Foundation by raising awareness of oral cancer. On November 16th we supported Blue Wednesday by joining the #bluelipselfie campaign. 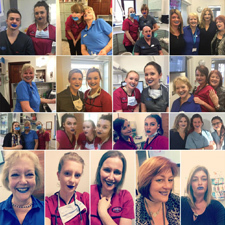 The campaign encourages people to wear blue lips as a visible sign of support for mouth cancer and take a selfie (see photo). This is a fun way to raise awareness of the disease and get everybody taking about mouth cancer, the risk factors involved, the signs and symptoms, and what we can do to help reduce our risk. In the UK, more than 7,000 people were diagnosed with mouth cancer last year. The disease has grown by a third in the last decade and remains one of very few cancers which are predicted to increase further in the coming years. Around 91% of all diagnoses are linked to lifestyle. This means that by amending our lifestyle choices, we can help cut the chances of developing mouth cancer. These risk factors are smoking, drinking alcohol to excess, the Human papillomavirus (HPV) and poor diet. Sores, ulcers or white or red patches anywhere in the mouth that do not heal within three weeks. Lumps or swellings in the mouth or neck that persist for more than three weeks. Difficulty in swallowing, chewing or moving the jaw or tongue. Numbness of the tongue or other areas of the mouth. A feeling that something is caught in the throat. Chronic sore throat or hoarseness that persists for more than six weeks. An unexplained loosening of teeth with no dental cause. If you notice any changes in your mouth or have any concerns big or small, don’t hesitate to book an appointments to come and see us.